We already received a huge box of sweets from my parents for Renee and Siena. It is filled with everything from heart-shaped Peeps to toy trinkets to chocolate shaped animals. So, the sweets for Valentine's Day are covered! 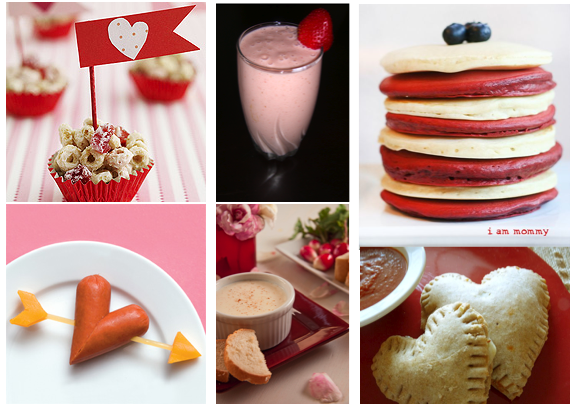 Now, as far as what I'm going to do for Valentine's Day–I'm going to try to throw in a little fun with food for the family, making the day feel a little extra special. Here are a few themed foods that I think will do just that. And hopefully they're ones you'll try, too. Cupid Clusters from Parents magazine. These would even make a cute little treat for the classroom. Get the recipe here. Get lovey dovey with your hot dogs. From Family Fun magazine, find out what the arrow is made with here. Luckily, having two girls means they'll pretty much eat or drink anything pink! This strawberry banana smoothie is right up their alley. Get the recipe here at iFood.tv. Now, something that you and your significant other can share–champagne fondue! yum! Can't wait to try this one out. A Communal Table serves up the recipe here. "Tower of Happiness" is what this should be called! My husband's favorite meal is breakfast and I know this will certainly make him happy! Regular and red velvet pancakes... I'll let you know how they taste! To try them yourself, go to I Am Mommy here. Finally... no, those aren't pies... they're heart-shaped calzones! Filled with mozzarella cheese, turkey pepperoni and marinara sauce. I'm sure my family is going to want these way after Valentine's Day! Find the how-to here. A Cake With a Surprise in the Middle! Weekend Xtra: "You've Captured My Heart"